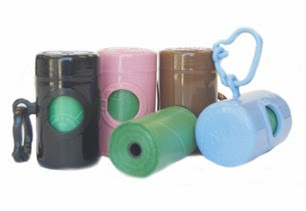 In order to survive as city dog, your mom or dad HAS to carry poop bags. You never know when you'll find the perfect cobblestone or sidewalk patch on which to squat, and they always need to be prepared. Besides the public embarrassment that accompanies leaving your poop on the ground, it can also cost you an expensive ticket (which means less money in the Greenie fund). The best way to carry these little plastic baggies is in a little dispenser that clips onto your leash, so you'll never leave home without them. My mom currently uses the Harry Barker No. 2 Pet Waste Bag Dispenser because it's 100% eco-friendly, and the brown matches my leash very nicely...but more about that later.